This little site has information about Tai Chi, the classes in Hove that I teach and a blog. I see no point in reproducing what you can find elsewhere on the web so I have included a page of links to relevant sites. The workshop with Dan in Horsham was really good as usual and as there were no beginners the whole group got on well with more advanced exercises such as Da Lu, Reverse Flying Flower Palm and Spear applications. Thursday 10th January 8-9pm. Cost £10 pw or £80 for the whole course on the first evening. Maximum 6 students. To reserve a place just phone or email. As you all know these are always interesting and informative so be there or be square! I love Radio4! Just been listening to The Museum of Curiosity (Series 13 Episode 1) in which Benjamin Zephaniah gave an impassioned case for donating Tai Chi. It was great even though some of what he said was disputable! Yang based styles, for example, are not always slow. Yes, the hand form is mostly done in a slow and controlled manner but some moves, such as Double Hand Sweep Lotus Leg, are quick and besides I do the whole form much quicker on a chilly winter morning than a warm summer’s evening! Also listened to Start the Week with Andrew Marr interviewing Yuval Noah Harari, the author of Sapiens and Homo Deus. Well worth a listen though they don’t mention Tai Chi! 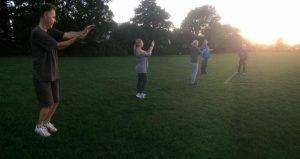 What a lovely a lovely evening for our final session of Tai Chi in the Park. Numbers varied somewhat but that’s holidays for you! There were two evenings with only one student and one with eleven but I have thoroughly enjoyed them all. Amanda gets the attendance award with 9 sessions closely followed by Martin but neither are in the photo above. Several players have said they will join us at the King Alfred for the winter so looking forward to seeing you all there. Great to see so many new faces at Tai Chi in the Park this evening. Hope you all enjoyed it. We covered: Stances, Seven Stars & Four directions Pushing Hands, the first twelve moves of the Short Square Form, Wave Hands in Clouds. I also explained that there are 5 elements in the Wudang System: Hand Forms, Weapon Forms, Pushing Hands, Self Defence Applications and Nei Gong. If you go to my teacher Peter Ballam’s site through the Links page above you will find video’s of all the Forms and Pushing Hands. If you want to find out more about Tai Chi and the Wudang Style in particular then visit my Sifu Dan Docherty’s site. I should have mentioned that we shall be at WISHFEST with an information desk in the Health & Wellbeing Area again this year. There will also be a demo at 4pm (England will hopefully be in the World Cup final not the third place play-off!) which you are welcome to join in. If not, I hope to see you all again next Monday. Hopefully that was the last of the winter weather so we can look forward to a beautiful Summer of Tai Chi in the Park starting on Monday 14th May. We shall concentrate on Dao-quan and Tui-shou, that is Hand Forms and Pushing Hands. I shall put some cards/posters around in the hope of attracting some new participants to the finest exercise system and martial art in the world. If you are reading this thinking about taking up Tai Chi then please do come and join us. It is a small friendly group you will quickly feel at home in and if you are interested in the martial rather than just the health side please let me know. Check out the pages on this site and the links to my teachers for more information or give me a call on Brighton 276695. Where: Wish Park – in the middle on the South side. Weather: If it rains wear a hat, I will be there! Parking: If you must drive be aware that there is limited Pay by Phone parking in Saxon Rd. The rest is residents only from 7 until 8. You can also park, for free, by Hove Lagoon if you don’t mind a little walk. I’m really enjoying Chinese Characters (1.45pm Mon-Fri Radio 4) although it has made no mention of taiji or any other martial art so far (Episode 4/20). It is a series of essays exploring Chinese history through the life stories of key personalities. Even most of us sinophiles can find getting to grips with Chinese history overwhelming but these bite sized stories give a real feeling for the culture, its length and scope. Enjoyed program by “Trust me, I’m a doctor”, presented by Michael Mosley on BBC1 on Wednesday night- The Truth About Getting Fit. It looked at the latest research, staged some ‘illustrative’ experiments and ended up recommending brisk walking (Moving step push hands, weapons forms), weights (Hand stands & Nei-gong) and dancing (Hand Form, applications, freestyle push hands) unless you fancy HIT – High Intensity Training (rolls + Running Thunder Hands!). Interesting that HIT only really works heart and thighs but the effects transfer to all muscles. Also, Getting Fit does NOT need will power, which will always let you down(! 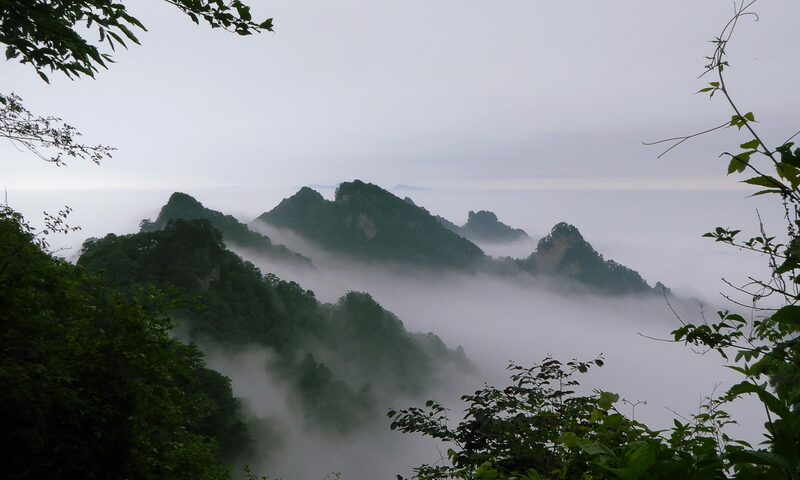 ), but immediate enjoyment (Chat and catch up during 7 Stars) as a reward plus the camaraderie of a group (Keen members of Wish Wudang Tai Chi Club always go to the pub afterwards and most attend the Spring Festival meal and Summer BBQ!). Looks like our system, Wish Wudang Tai Chi Chuan, covers all bases but then it has been refined by trial and error over several hundred years so I am not surprised, just smug! And how did I do in the tests? 10 in 11s and PR 93 which is OK at 71. There has been a fun discussion on Facebook after someone posted video of a charlatan in a Chinese park bouncing some poor acolyte around using empty force. Dan then posted on his blog http://www.taichichuan.co.uk/blog.html an account of the famous Water Incident when a certain renowned purveyor of kong jin, Dr Shen Hongxun, was made to look rather foolish. I first heard about mt force in a book on karate I read as a young teenager (what is now, bizarrely, called a ‘young adult’). In it an old master was said to be able to project his Qi by shouting “KAI!! !” and could use this to knock birds out of trees. I was both fascinated by the idea of being able to cultivate such a power yet disappointed at its weakness. Now if it could lift a spaceship out of a swamp… but this was a long, long time ago before Star Wars was a twinkle in George’s eye and I guess most kids dream of having super powers. That, of course, is what brought me to martial arts. I quickly found that at Judo a good little’un could beat a big’un but a good big’un was more of a problem and I was a little’un! The answer, of course, is to train harder and longer than the big b******s and so to have gongfu – skill acquired through hard training. By the way the term can apply to any skill not just the martial arts.